Toronto's finest Master Clothiers and Tailors offer quality Bespoke and Custom menswear for discerning clients interested in quality, attention to detail and an eye for design. At King & Bay, we are in a business of finishing touches, fine details and small adjustments that can make a big difference. So you’ll forgive us if we boast a little about our family of master tailors who bring our garments spectacularly to life. Our custom tailored and Bespoke suits are hand crafted in a family-run studio, proudly operated by 5th generation craftsmen. Generations of experience at your service. Each of our King & Bay Master Tailors has an unparalleled eye for detail and a deep understanding of of how a great suit should fit. This amazing group provides the finest custom menswear to our discerning clientele looking for quality, sophisticated design and a unique experience. Designed With the Eye of a Master. Try us on for size. We guarantee your satisfaction. When it comes to creating a garment that fits and feels just right, our Master Tailors are committed to every stitch. 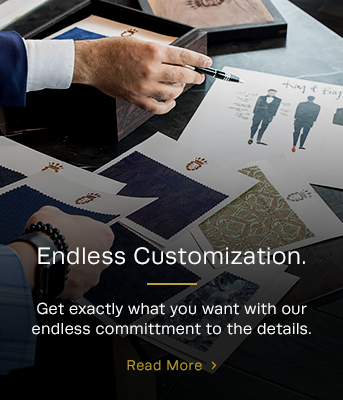 Your suit from King & Bay comes with the opportunity of endless customization – a process where you can alter, adjust and experiment to create a garment that is 100% you. We start from scratch and design exclusively for you and your lifestyle. In the end, the final details are all yours.